FACT: As of September 15, 2009 the Longmont City Council has not even been presented a Resolution to vote on to dissolve the Clover Basin Fire District Tax (CBFDT). This will have to be done at a City Council Regular Session, the next one is scheduled for September 22. But after an inquiry to the City about this issue, I was told (on September 15th) that they don’t know how long it will take to have the documents ready. The next Regular Session is not until October 13th! While this probably will be accomplished someday, it is not a done deal yet. Councilmember Benker’s claim is completely false and misleading. But even if this Resolution was already approved by Council, consider this: at that council meeting of July 21, and the video is available at the city’s website to see for yourself, Councilmember Benker argued at least 3 times to put this issue on the ballot. This surely would have meant defeat and guaranteed continuation of paying this tax until 2015! 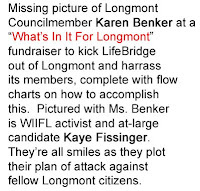 Even after a clear and concise explanation of the consequences in going to all of the voters of Longmont, and how it was the absolutely worst option, Councilmember Benker still wanted to press forward with her ballot motion and wouldn’t even consider withdrawing her motion! On Councilmember Benker’s website she asks: “Please call me if you hear of something that may not be true and want to verify it’s accuracy. Email: KarenBenkerlg@earthlink.net Phone: 303.774.7745. • Why is she taking credit for something that is still not a done deal? • Why did she make a motion for a course of action that would have meant defeat at the ballot box, and a continuation of the tax? • Why would she ask to take an estimated $75,000 from the city’s General Fund to put this on the ballot or Special Election? • Why would she put the people of Clover Basin, her Ward 2 constituents, in a nearly impossible electoral position, forcing them to spend endless hours and personal expenses on: formation of an issue committee, phone calls, brochures, door-to-door activity, signs, contributions, campaign finance reports, newspaper editorials, website, etc – for ALL of Longmont, not just Clover Basin? It’s obvious Ms. Benker is using this as a campaign issue and as some sort of feather in her cap. But regardless of how she may have appeared to be an advocate for Clover Basin constituents during the Task Force meetings, her own words and actions paint a completely different picture. Anyone in this neighborhood who is thinking of supporting or voting for Ms. Benker needs to seriously consider the above information, which is a matter of record, not opinion. If she had succeeded in her concept and motion, Clover Basin citizens would have been dealt a serious blow. Explain again how she’s an advocate for them? I don’t see it. 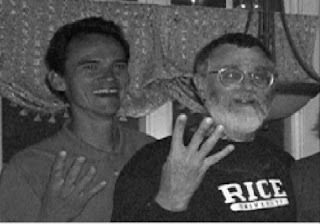 The 2009 Longmont municipal election is coming up, I thought this would be a good time to look back at the election of 2007 that brought us what has been called the “Eastern Bloc”, the “Benker bloc”, the “Bloc of 4” etc. You’re reading that correctly, they didn’t get a plurality or majority. I included links to definitions as some in the city don’t know the difference. The point is Longmont did not swing blue, or left, like some would like you to believe. The election of Gabe Santos in January 2008 proved that. When voters in Longmont actually show up to vote, leftist, radical, anti-growth, anti-development, anti-religious candidates lose. When the vote is suppressed, or the system makes it harder for citizens to get involved and engaged (like the incumbent bloc’s overly restrictive “fair” campaigns act), candidates like “the bloc” win. It’s always amusing for me to take a national topic and apply it to things right here in Longmont. Today I’m going to do the opposite. Of course we all know by now some members of Longmont City Council have a real problem with open government and transparency. For those with short memories, there was a block of candidates back in 2007 who made no attempt to hide they were indeed a, well, block of candidates. They got funding from the same sources, they shared ad space, they appeared together at party (Democratic of course) functions (and still do), and they shared in their victory as a, well, block. The title they attained went from “block of candidates” to ‘Bloc of 4‘. Say that around them now and they either try to deny it or get visibly irritated. Hey, embrace what you are. But back to this transparency thing: these former candidates (and their loyal mouthpieces) sure went to great lengths to say how closed off and non “open” our previous council was. This was their rallying cry. That, and how they would do things differently. Well, they have. Worse. They now hold the honor of the most secretive and closed city council in recent memory/history. And like the national example I’m about to show you, they (and their loyal mouthpieces) sure don’t like to be called on it. They even have the nerve to go after and call names of those that put into daylight their questionable, and possibly (no, probably) illegal ways. Thanks to the miracle (and a new found one to some city councilmembers) of Open Records, here’s what goes on behind the scenes. This is just what we know about, I’m sure there’s more and worse. <macguiguru@spamcop.net><ksfissinger@msn.com><djleise@comcast.net><seanpmccoy@msn.com><levison4longmont@yahoo.com><karenbenkerlg@earthlink.net>Well that subject and text sound like a threat, wouldn’t be the first. Pratt to Fissinger: Analyze this! Subject: Re: Please go vote. I wonder who’s paying the Rodriguezes? This was referencing a poll we didn’t post, someone else did. But it brings up an interesting point: We don’t get paid by anyone to do anything. But the fact these types of people would think it<macguiguru@spamcop.net><ksfissinger@msn.com><djleise@comcast.net><seanpmccoy@msn.com><levison4longmont@yahoo.com><karenbenkerlg@earthlink.net><karenbenkerlg@earthlink.net><macguiguru@spamcop.net><city.council@ci.longmont.co.us><macguiguru@spamcop.net><ksfissinger@msn.com> gives you an insight to what they probably do. I always wondered why they threw around “paid hacks and shills” or “agents”. I guess since it’s normal for them to engage in such behavior, the simpletons must have figured everyone else does it, too! Sorry to disappoint. Catch that? This cute little flag@whitehouse.gov (the email address to report people saying bad things about Obama’s health care plan today, who knows what tomorrow) by accepting a single email and not keeping it breaks the law! Personally, I don’t see how anyone – liberal/conservative/libertarian/anything – wouldn’t have a huge problem with this. Right, they’re not going to keep or collect information based on these emails. Then why ask for them? In closing, just like I said in my earlier “Amateurism from the top down<macguiguru@spamcop.net><ksfissinger@msn.com><djleise@comcast.net><seanpmccoy@msn.com><levison4longmont@yahoo.com><karenbenkerlg@earthlink.net><karenbenkerlg@earthlink.net><macguiguru@spamcop.net><city.council@ci.longmont.co.us><macguiguru@spamcop.net><ksfissinger@msn.com>” piece, you have to <macguiguru@spamcop.net><ksfissinger@msn.com><djleise@comcast.net><seanpmccoy@msn.com><levison4longmont@yahoo.com><karenbenkerlg@earthlink.net><karenbenkerlg@earthlink.net><macguiguru@spamcop.net><city.council@ci.longmont.co.us><macguiguru@spamcop.net><ksfissinger@msn.com> take these people collectively as a group (and they love that collectivism stuff). If you like <macguiguru@spamcop.net><ksfissinger@msn.com><djleise@comcast.net><seanpmccoy@msn.com><levison4longmont@yahoo.com><karenbenkerlg@earthlink.net><karenbenkerlg@earthlink.net><macguiguru@spamcop.net><city.council@ci.longmont.co.us><macguiguru@spamcop.net><ksfissinger@msn.com>secrets, information gathering on political enemies by elected officials, closed government, and<macguiguru@spamcop.net><ksfissinger@msn.com><djleise@comcast.net><seanpmccoy@msn.com><levison4longmont@yahoo.com><karenbenkerlg@earthlink.net><karenbenkerlg@earthlink.net><macguiguru@spamcop.net><city.council@ci.longmont.co.us><macguiguru@spamcop.net><ksfissinger@msn.com> basically just stupid and ignorant behavior – well, then you’ve probably already stopped reading by this point and most of us could care less what you think. The rest of you need to vote these kinds of people out of office ASAP and not allow their fellow travelers anywhere near elected office. In the July 14, 2009 Longmont City Council meeting, the issue of the former BMX track came up. It used to be over by Union Reservoir, but is now gone. Councilmember Mary Blue was asked about it at Rhythm on the River recently, and the constituent eluded to a fee hike as the reason they are gone. Well, they were partially right. It was an attempted fee hike by Councilmember Sarah Levison, and her cohorts on council (Sean McCoy and Karen Benker) couldn’t say no to a fee increase (a form of a tax). I talked about this with lots of audio in a podcast back on May 4, 2008. So the greedy get too greedy and end up with NOTHING. Councilmember Levison wanted to shake down the BMX people for a $100 here, $50 there, cleanup fees over there (which already existed) and what did the city get for her idea of “incenting”? Not a thin dime. As a matter of fact, money lost – and a venue gone and probably not coming back. Would you? And you thought raiding Estate sales (as in recently dead people) for tax revenue was the beginning? Nope. She first went after kids, their BMX bikes and family fun. Why am I hearing The Beatles “Taxman“‘s line “declare the pennies on your eyes“? These tax-and-spend types have no shame or decency. Since it changes almost weekly, I don’t have the exact number of Executive Sessions the current Longmont City Council has held in the last couple of years. It’s probably around 26, which means the council that’s been in office since November 2007 has held 1.4 Executive Sessions per month since they’ve been here. That’s just ridiculous. For those that don’t know, an Executive Session is a meeting that is closed to the public. You can’t know what goes on or is said in those meetings. It isn’t recorded or televised like City Council meetings, you can’t comment, you can’t be told what went on, you usually don’t even know who requested it and specifically why. A couple of things you need to know to get the full picture: at least one councilmember doesn’t like being held accountable for his often abrasive and utterly embarrassing remarks. After making said remarks, feels paranoid enough to ask the local police department to show up at council meetings for his safety. If you know anything about YouTube, you’d know that any public official can and often is featured on this site basically being themselves, good or bad. This councilman has publicly requested there be a way to stop this from occuring. Or audio from meetings being used in some way. Did I mention he and others on council also have a vendetta against the local newspaper – so it’s pretty much all media they want shut down and not commenting on their public activities. Reminder: a) these are elected public officials, and b) last I checked we’re not in the USSR (yet). So how does one stop ones idiotic remarks from actually getting read or heard? Secret meetings closed to the public! Brilliant! But really, how bad could it be? Who could be so paranoid and such a lousy public speaker to cause such a shift in public policy and this need for covertness? Oh, there’s much more at my YouTube channel, but one can only guess what goes on behind closed doors. 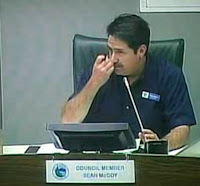 But he’s not alone, other members of this majority on council (that would be McCoy, Karen Benker, Sarah Levison, and Brian Hansen) have blathered repeatedly and at least one has shown their concern and curiosity over citizens having cameras at council meetings. Nevermind that these meetings are televised LIVE, re-aired, and available at the library to check out on DVD. So why would someone be so concerned about their own words? Things like: name calling, saying how they really feel about something or someone, attacks on citizens, anti-religious comments, praise for Dear Leader, war on Firestone, war on Times-Call, war on free speech, prairie dog amnesty, mosquitos are human too, who haven’t we taxed yet and how do we go about it, fees are too low – we need more and higher fees, screw city employees, etc etc etc. Feel free to submit your own. They can say all they want they didn’t say it, but can they prove it? Nope, no records. Double sided sword. Come clean and stop these secret meetings, or that list, correct or not, will only grow. You’ve worked your whole life, you die, your family tries to sell off some stuff for whatever reason (pay off debts, pay for your funeral, etc) and the taxman, or taxwoman in this case (Longmont City Councilmember Sarah Levison) follows you to and beyond the grave to collect. Apparently someone in town was holding an “estate sale” and Ms. Levison wants the city to get its fair share of sales tax revenue from this sale. She “had an occasion to stop by” this sale, said she didn’t buy any of the $500+ items, and has now turned snitch on the people holding it. I’m sure it will greatly help in the grieving process. She said she “noticed they were not collecting taxes for the City of Longmont”. She’s either clairvoyant or actually asked them, but she didn’t elude to that in her comments. How does she know they weren’t collecting sales tax for Longmont or the State of Colorado? That’s right, she doesn’t. Don’t you love those kind of people who show up at places (usually uninvited as anyone who knows them would just assume not invite them to anything) and start throwing their weight and opinion around? In this case a city councilmember making assumptions (correct or not) about a possibly criminal activity, in her opinion. Once again, with some people their instincts and principles just come natural in social settings – in this case a nosey, overtaxing nanny-state type. It’s not enough that they want to bring back the “Death Tax” (“Estate tax” is just too nice) and tax you your whole life and into the afterlife spreading their misery to those you leave behind. But tax them again when they try to sell your stuff, probably just to keep the house you lived in and paid a mortgage on for years. But that’s not all! She also wants to find out if maybe the state could go after these people, she’d “hate to think that we might have lost several hundred dollars worth of tax income that day“. She ended with “we need every dime we can get these days“. First off, “we” being the government, is supposed to be us, the people. It’s amazing how quickly elected officials forget that and find as many ways as possible to siphon off money from citizens. Second, if this city didn’t squander money away so frivolously in the last 18 months (about the same time as this weak majority has been on council – no, precisely the time this weak majority has been in charge) this wouldn’t be so much of an issue. It was Ms. Levison in particular who led the charge with last minute adjustments to the recent budget, things dreamed up on the fly with no public notice. You must know where this is leading, get ready for…. …and here’s your future garage sale monitor and elected busybody, Sarah Levison, At-Large Longmont City Councilmember. On Sunday June 14, 2009 the Longmont Times-Call did a fairly large piece on emails and Open Records. It sounded sort of familiar as I’ve written about it over the last year, did my own Open Records request for these emails, and my wife has discussed this with council members. Something I want you to keep in mind when you read these stories and the editorial that came out the same day: when you hear a councilmember, Karen Benker in particular because she asked point blank about this issue, don’t assume for a second “they didn’t know“. They knew alright. Councilmember Karen Benker asked City Attorney Clay Douglas about (the LifeBridge Open Records request) and it turned into a fairly long discussion covering emails, phone calls, and the recording and reporting of these. Some of you may not have been aware, but every correspondence you send to city council, and presumably city staff, is of the open record variety. And, when councilmembers receive these, they are to forward them on to city staff for retention. I got the strong impression this hasn’t been followed by some on council. And there seemed to be concern about “personal” emails, and when items are confidential and when they aren’t. It sounds like very little is private when it comes to just about any correspondence between constituents and their city council members. Apparently, the proper way for a councilmember to respond to an email is for them to CC the reply to the appropriate city staff email address so they get a copy of the original email and the response. And it was also implied that if the councilmember replies and forwards the reply on, it must include the original email from the constituent or the Open Records Act was not properly followed. There’s more, relating to Open Meetings laws and how this “new” council was advised of all of this. No excuses. These councilmembers were well aware of all the laws and procedures, but will they be held accountable? What do you think? Karen Benker basically admitted to violating this in one of the stories (‘Lot of room for error’ built in). Even if it “wasn’t made clear to her when she was appointed to the council in 2005“, this is a lifetime bureaucrat, are you really buying that? And again, she asked the City Attorney during an open council meeting about this April of 2008, over a year ago! So not only has she violated this statute, she’s lying about her knowledge and legal advice on this issue. I did an Open Records request of council emails a few months ago. I was shocked at gaping holes in time of absolutely no emails, entire months wiped clean. I know for a fact I sent some emails to councilmembers before, during, and after that time period. Most were not forwarded. And as you saw, Councilmember Brian Hansen was the worst offender in this program and Times-Call attack dog Sean McCoy wouldn’t even respond for their story. A pretty important issue, don’t you think? Well, not if you’re the local village idiots who think Benker, McCoy, Hansen, and Levison can do no wrong. Yes, that’s right, they are defending blatant intentional flaunting and violating of state law. Why not? They have the majority, right? The new City Attorney probably isn’t aware of what the previous one said about this (and that list grows by the month), so don’t expect much there. So which is it, are they just babes in the woods playing it by ear? Or outright lawlessness?